Serco, which is bidding for the next Clyde and Hebrides ferry contract, already runs NorthLink services to Orkney and Shetland (pictured). 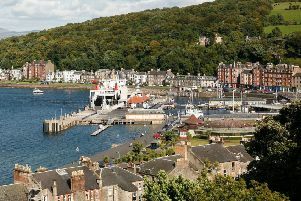 The private firm hoping to win the contract to operate ferry services in the Clyde and Hebrides will be in Rothesay tomorrow (Thursday 12th) to talk to Bute residents about its bid. Serco Caledonian Ferries Ltd, a division of the multi-national Serco outsourcing company, is competing with the state-owned CalMac Ferries Ltd for the right to operate publicly-funded lifeline services for eight years from October 2016. The company’s representatives will be present at a drop-in event at the 292 Club in Rothesay from 11am until 5pm on Thursday, giving members of the public a chance to ask questions of the firm and its bid plans. Serco already holds the contract to provide lifeline ferry services to Orkney and Shetland under the Northlink brand name, and also took over operation earlier this year of overnight sleeper trains between Scotland and London. Last month SCF bid director Jonathan Riley told The Buteman that island residents “should be reassured” by the company’s activities elsewhere, in the light of the strike by CalMac’s RMT employees in June over the possible implications of Serco winning the contract.